We started our trip stopping in Bernie to see the TasArt show. There was some interesting Art displayed and we were pleased to see Graham’s paintings were nicely hung and lit well, which gave us a nice vibe to start our trip with. We took the Spirit of Tasmania ferry to the Australian Mainland (an overnight trip) walking into our home for a night cabin, chose which single bed we wanted, looked out the portlight (window) and stowed our overnight bag and headed to the stern bar to watch our departure over a drink. Having your own toilet and shower is a nice thing. We settled in for a lumpy but uneventful trip, well… other than when we were woken around 11 pm as our car alarm went off with the motion of the boat. Oops, we didn’t notice the tiny signs advising people to disable car alarms when we parked. However the staff that woke us up took our keys and sorted it all out for me while Graham snoozed away. He does love his ear plugs. We've decided Friday is the best day to take the ferry to Melbourne, as there was no traffic when we got off at 6 am which gave us a clear run through town, making navigating a breeze. As a matter of fact, we probably saw 20 cars all up until we got to Mount Gambier via the inland route. Hooray for us. We swung back to the coast to stay in Robe for the night. Robe was as delightful as we remembered it. A picturesque lazy little seaside town, tidy and flat, which oozes relaxation and holiday. 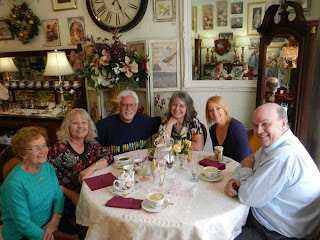 We had a little drive around the suburbs before we checked into the Lakeview Motel, and tidied up before we met our friend Trish’s mom Ros and friend for dinner at the local Pizza place. It was a really pleasant evening, and listening to them chat about their lives in Robe certainly raised it up on our “could we retire here” list. Ros invited us for breakfast at her place before we looked at a little property we were interested in. It didn’t suite us in the end, but we had a good snoop around the town, and outer suburbs before we left. It was a fairly swift drive to Adelaide. 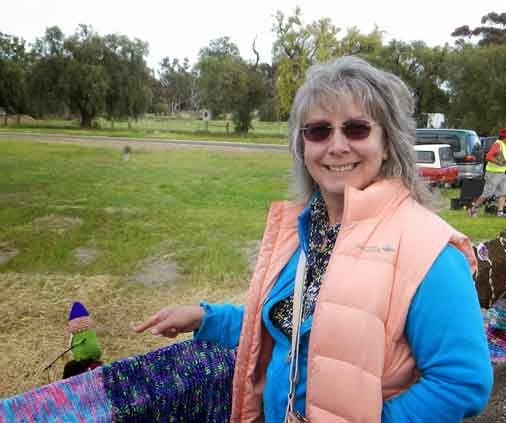 Our plan was to spend the first half of our visit with Ilea and Glenn in Morphettville while visiting the northern part of the family, then move to Graham’s sister Jude & hubby Lee’s while we visited the southerners, and went to the Art Show opening. But then plans are made to be broken aren’t they? We relaxed at Ilea’s for a day after our three days of driving, just hanging around the house, working in a trip to the Orange Spot for a pastie, taking the dog for walks and putzing around in general before our visiting schedule began. Graham even squeezed in a doctor’s appointment on the Tuesday to get a referral for an appointment with a throat specialist for Wednesday. Both appointments he got were cancellations, how’s that for kismet? Monday night Ilea prepared delicious Barramundi burgers – perfectly cooked, on soft rolls with sweet potato chips (that’s YAM to you North Americans) and salad. Tuesday we met Graham’s sister Kath, brother-in-law Ian and mom Helen for lunch at her favourite café, Domain Décor. Our eyebrows rose as we drove past the little shop and noted the extremely busy windows. I couldn’t repress a little smiled as I looked at Graham fairly sure what was coming. We opened the door and stepped back as a wave of potpourri enveloped us. “Oh no, This is a nightmare for me” groaned Graham as we entered a little shop crowded with shelves, all overflowing with little figurines, lacy hankies, quilts, tea cups, doll house miniatures, soaps and hundreds of sachets of potpourri. I scoured my purse and found one antihistamine, which I gave to him so his head didn’t explode, as potpourri is his sworn enemy. We carefully navigated our way into another room with tables, eyes wide in wonder at the vast array of knickknacks as we wound our way amongst these treasures to undulate into seats a table laid with loving attention. 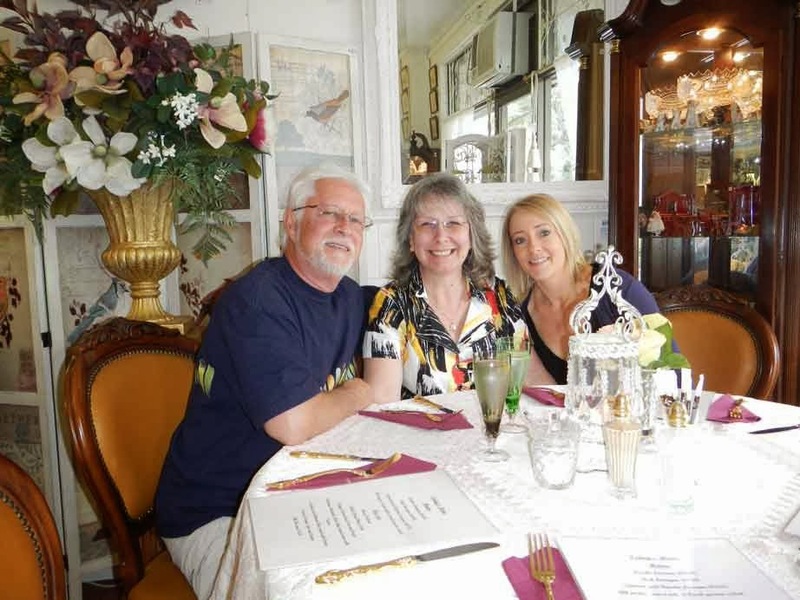 Gold plated cutlery, lacy place mats and beautiful delicate stemware, understanding how this would be Helen’s favourite restaurant, as we joined the blue haired clientelle. When they arrived we enjoyed animated conversation, and the food which was simple and very tasty. Tuesday night was Glenn’s “Duck Night”. I loved that even though he was nervous about cooking under our scrutiny, Glenn let us sit at the counter while he prepared his duck dish. When I can sit in a kitchen while someone cooks I often feel like I’m watching a cooking show. Wine in hand we sat back to enjoy an episode of “Cooking with Glenn” – “Balsamic Duck Breasts” with sou chef Ilea preparing yam towers with broccolini and snow peas. The duck breast skins were scored, then set to marinade in balsamic vinegar for 20 minutes then baked. Glenn pulled off the perfect breasts, rare and juicy, Ilea the perfect accompaniments. Well done Gunders Team! Wednesday Ilea and I went one way, and Graham and Glenn the other, meeting up for Yum Cha in the city before we headed to Kath & Ian’s to see the Northern families for a BBQ. It was a lively large crowd with some other of Graham’s siblings, their kids and grand kids, and Grahams Mom all coming. We were pleased we managed to speak to almost everyone present, no mean feat with almost 20 people there. We enjoyed the classic Aussie BBQ of chops, snags, chicken wings, and a good variety of salads, rolls & deserts. Delicious!! Hats off to the Manson’s for feeding such a large crowd so well. Thursday is where our plans went amok. Graham had an uncomfortable night with knifelike cramps and gastro, which just got worse and worse so we had to start cancelling/postponing our plans, so the shuffle began. We deferred our move to Jude’s, and postponed a reunion with Keith a friend of Graham’s from his gymnastic days as a kid, as well as dinner to meet Jasmine’s boyfriend and family. Prada, Ilea’s dog did fairly well out of this, as she and I spent some quality time together while Graham slept on the couch. Saturday he was no better so we went to the local medical centre where a doctor spent a half hour with him then gave him a letter to take to the hospital. Here is where I started to feel nervous. We went to Flinders hospital, where they “contained” him in emergency. Everyone who came near him “suited up in a yellow plastic gown and gloves”. Increase in nervousness. He was there for 6 hours, hooked up to a drip hydrating while they ran blood tests. They let him go so I’m guessing he wasn’t contagious. We arrived at Jude and Lee’s with just enough time to change, and leave for the opening of the Fluereu Art Prize. Graham felt better after the drip, but was really in no shape to go out, however his strong will carried him, determined he’d go but wouldn’t risk anything to eat or drink. 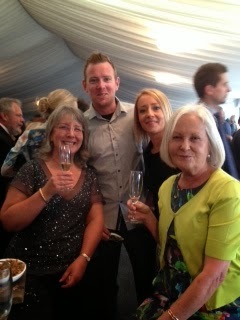 The event was in McLarenvale, a beautiful winery area of Southern Adelaide. The day was warm but the wind was bitingly cold. We started at the Hardy’s Tintara winery sipping wine while we moved about the finalists art on display then moved to d’Arenberg’s winery for the winner announcement/cocktail party. Normally I think we would have enjoyed sipping wine looking over the stunning views, but the biting wind moved us into the marquis where we snafued stools, and with the men on the hunt bringing us nibbles, we did quite well. I was thankful I’d brought a heavy wrap. We didn’t stay late, conscious of Graham’s uncomfortable state of well-being. Sunday was road trip day to view the other works on display for the Fleurieu Art show scattered amongst other galleries in McLarenvale. Lee carried on to the farther galleries in Gawler and Strathalbin, stopping at the very well known Flying Fish Café in Pt Elliot, (excellent fish and chips by the way) which was terrific although the little trip totally exhausted Graham. Rescheduled reunion night. We went to the Marion Pub for dinner with Keith and Sue, Graham’s friend from his youth. Keith told Graham he had done the math and they hadn’t seen each other for 42 years. They both lit up as soon as they saw each other, Keith is an easy going fellow and the two of them nattered away as if they’d only seen each other yesterday. It was a lively night. The added bonus was Sue, who is also delightful. In fact, we enjoyed each other’s company so much we planned to meet again before we left. I know - I can't believe I didn't take a photo!!! AAAUGHH!!! Well I guess that goes to show how messed up we were by that point. Monday was our rescheduled “meet the Mason’s night”. Jasmine and Jayden came early to Jude’s for a short visit before we left for dinner at her boyfriend’s parents - the Mason’s. Jude and Lee had put together a lovely antipasto platter so just time for a drink and wee nibble and we were off. Jayden looked lovely, was cheery and engaging and has grown up considerably since we last saw her. Heath’s parents, Jan and Ken live in Port Willunga in an impressive stone house Ken built himself. It’s quite a house – large, 3 levels around the outside walls, with a high ceiling in the middle. Jan cooked as if for 20 or Royalty. I was delighted she let me hang out with her in the kitchen while she finished preparing her canapés, and again while she served up. We chatted in the living room over a drink and nibble, and found them very interesting, and easy to talk to. Jan called us to a groaning table of roast beef, legs of lamb, 2 marinated chickens, and a rolled stuffed chicken breast. Roasted potatoes with rosemary and garlic cloves, a green bean salad as she’d heard beans were good for Graham’s condition, salad, mango salsa, rolls, potato salad, and on and on… followed by a plum cheesecake. Too bad our bodies won’t let us just keep eating when something tastes good!! They were lovely and interesting to talk with. It was a most enjoyable evening and a delight to know Jasmine and Jayden are enmeshed with lovely people. Keith and Sue had us over to their home on Tuesday. They have a nice little oasis with a beautiful garden, and two friendly dogs to greet us. It was another relaxed evening, and terrific to see a friendship reborn. The smell of the lasagne Sue had cooking was driving me somewhat crazy and tasted as good as it smelled, served with salad with garlic bread. Poor Graham smiled weakly when he turned down balsamic strawberries with ice cream. It’s been hard for “Mr I love diary”. Balsamic strawberries, yumm! Wednesday Lee made us his secret hamburger recipe. We sat in the kitchen discussing how these hamburgers could be so different from anyone else's..… Ah, that's because the ground beef came from cattle from the Adelaide hills, who only feed on clover grown on northern facing hill sides, with soothing music played from speakers in the trees to keep them calm and happy which causes better marbling for the best intensity of flavour. The buns baked with freshly ground grain, and the produce plucked from his garden moments before serving. Crazy kid. The burgers were great, and the “shoo us out of the kitchen” to make secret artistic home cut fries towers was a nice touch. Sadly everyone was cooking wonderful food which Graham could only pick at, knowing it would cause him great discomfort in a short time. Although that was hard for him, and I felt sympathy at his continual discomfort, personally I loved the food. 30 Oct – Farewells are always hard. This trip we'd missed seeing several folks, due to Graham's illness, but what can you do. We had a slow start, chatting with Jude & Lee while Jude packed a little picnic for us and we set off, making our farewell calls while we were on the road out of town to others we hadn’t gotten back to see. We stopped in Talem Bend to enjoy the gourmet picnic lunch Jude provided then carried on. 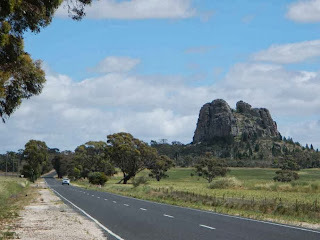 Our planned trip to Naracoort to see the caves changed as we reached the turn in the road. Graham was pooped so we chose the shorter trip to Nhill. If we wanted to stay and rest for another day, we could check out the Star party public night. Our thinking? If the public star party was a wash, we’d cancel our reservation and go home early. We checked the rooms in several motels before we booked into the Motel Wimmera. Small and older, but clean and tidy and the owners couldn’t have been more easy going, and nice. They even gave us a plate of warm muffins when we checked in. Her advice on where to eat? So we unloaded the car, ate our muffins and snoozed before we relaxed into the warmth of the evening strolling back to the hotel in town. Our motel host chased us down in the truck on the way to see if we wanted a lift. How nice was that? Schnitzel night in Nhill is HUGE. The dining room hummed as generations of families lined long tables, kids scurrying around climbing under chairs and tables, as we sat as if in the middle of a reality show enjoying the buzz of a small close community. 31 Oct – Friday – We asked to stay another night, wandering across the road to have breakfast at the truck stop before we drove to Mount Arapiles through the Little Desert National Park where the red dirt on the roadside made me think of good old Australian movies, as did the mallee bush country we travelled through. Soon the scenery changed to thriving fields of wheat, oats and canola on our way to the Mount Arapiles-Tooan State Park. The locals told us after a 10-year drought, they were hoping for a prosperous crop this year. We stopped at the “Mitre Rock” and decided to climb it. To be frank, I thought there was a path to the top however it appeared we were in fact rock climbing, with me relieved to see only skinks and not snakes as I found handholds in the rocks. I was convinced there would be an easy path down for us to take on the other side. The view from the top was stunning, a green patchwork of crops with a central great lake oneway, Mount Arapiles the other. “There is a quicker way down on this side, but I don’t think you’re going to like it” Graham called as he looked over the jagged edge. His legs were burning after the exertion of the climb and being ill for so long. We opted to return the way we came up. 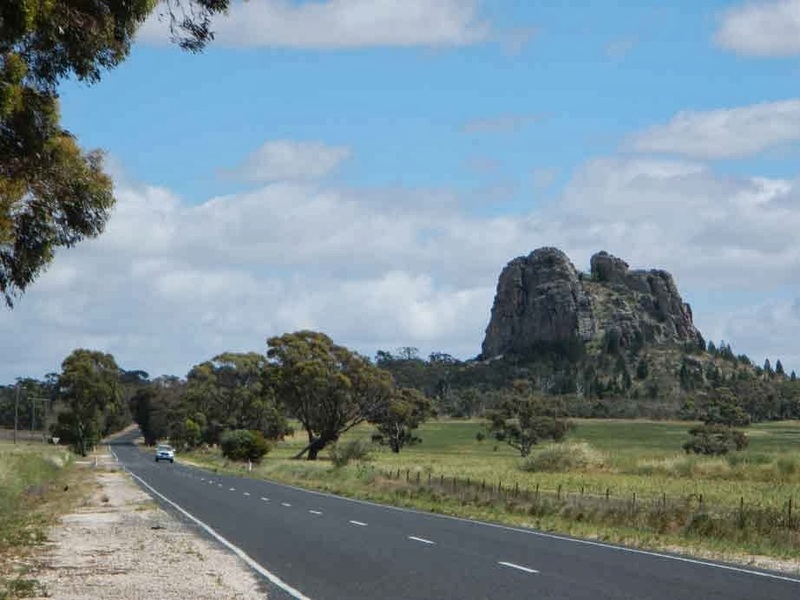 Mount Arapiles summit was an easy drive, but sadly we enjoyed the view for only a few moments, before travel belly signalled me and we had to head back. Our multi stop trip home took us through the small village of Natimuk where we found people decorating the tree-lined meridian down the centre of town with all manner of unusual things. 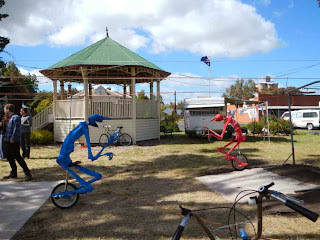 Life sized figures on bikes, girls running fairy lights, and streamers through the trees and marquees piqued our curiosity. 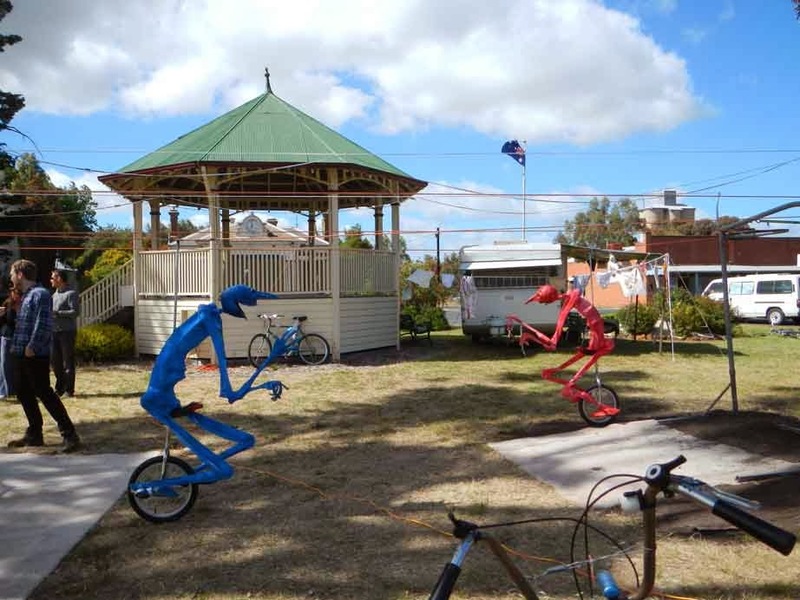 Turns out Natimuk has an annual fringe festival where the town numbers swell from 500 to 3000. We stopped at Dimboola for smoko and wandered around this town, which looked to be struggling to survive. Shops were closed, the hotel burnt and windows showed real estate for sale at bargain prices. Graham found an Art Gallery and someone to chat with for a time before we headed back past “Pink Lake” which was in fact a salt lake and truly looked pink. Our Motel hosts let us use their washing machine, then invited us for a drink and nibbles in the garden with a couple of others. It was nice to chat with locals about the area before we headed to their recommendation for Friday night’s dinner, The “Trucker’s Trailer Exchange” food trailer which pulls up 6 nights a week. We chatted with a trucker in the heat, swatting the hundreds of sticky flies while they made up our steak sandwiches. “They make the best steak sanga on the road, always tender and none of that chewy gristle. Worth coming for Mate.” He assured us in his broad Aussie accent. We decided to take them back to the motel to eat ‘sans flies’ before heading out to the Little Desert Lodge for “public night” star viewing. It was interesting to see how everyone organised their equipment, from trailers for carting, to special slider chairs, computer hook ups, light set ups and covers. I was surprised to see someone utilise a little en-suite tent. This was a celestial gadget head’s dream. We wandered around chatting, and admiring the equipment as it was being set up. I was interested to find they had a talk organised for the public where they tell them about the ‘etiquette’ of looking through the very expensive equipment there, and great cross section of people came to hear it, and look through the equipment available. We left around 10 feeling comfortable the star party should be good. 1 Nov – Saturday – We packed up and collected our laundry from the line, just after an early morning shower had dampened it. Our plan was find a laundry-mat and breakfast. Clothes in the dryer, Graham popped across the road to see if the hairdresser would give him a trim, which she did without charge along with some local gossip and breakfast advice. 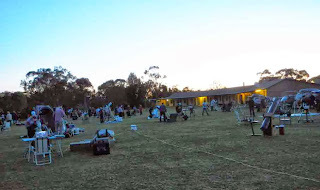 We stopped in Horsham to pick up a couple of cheap deck chairs, and a tarp to use to ‘lay out Graham’s ground’ for the star party, then set off to enjoy being tourists in the Grampians. Mckenzie waterfalls called us to stretch our legs, watching the water twisting it’s way through its rocky path, foaming down into sparkling pools drew lots of holiday makers. I felt cooler just listening to the dull roar from the shade of our viewing platform, the sounds of excited children laughing and the local birds added to the serenity of the moment. Halls Gap was packed with tourists, a nice little holiday town, tree lined and lush with shops a plenty. We made the turn and headed back to Horsham for a Chinese dinner, then settled in for a good night sleep. Sunday – we got a few nibbles, and headed to the Little Desert Nature Lodge, stopping at the “Nati Fringe Festival along the way. 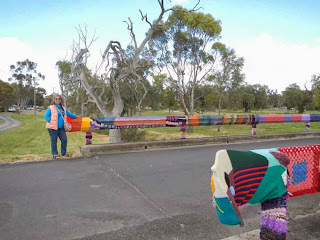 We parked beside a yarn bombed walkway, and enjoyed the yarn bombed bridge and other areas encased by those crazy knitters. Natimuk was hustling with people wandering around the town enjoying the festival air. People were still engaging with the performers at the various sites, even while they were deconstructing their events. The market was thriving with a fair section for the kids, and a good cross section of produce, plants, foods, locally made products, as well as the usual second hand stalls. We nibbled at a thing or two then tried to get a takeaway coffee at the only café. Not willing to wait 45 minutes, we carried on our way arriving at the lodge at Noon. Our accommodation is serviceable, not luxurious with 2 single beds, and an en-suite bathroom. That alone makes me happy and Graham relieved. There is a tea & coffee making room for the en-suite stayers - beside our room, and a lounge area in a separate building. The cold wind had people hiding indoors, but Graham doggedly set up on the lawn before dinner, tarp pegged into the ground, tripods set, then back to the room for a rest before heading into the dining room for 6:00 when the bar opened pre 6:30 dinner. It was a standard Sunday roast, with potato, carrots and peas. The desert was a damn good sticky date pudding with caramel sauce and ice cream. The people here stampeded to the bar then stampeded to the food service. It’s like being a kid in camp, only with liquor. There were movies starting at 8:30 for those who didn’t want to be outside, but Graham was chomping at the bit. Out we went, finished setting up and wandered amongst the others. Thankfully the wind settled as the night got darker and colder, dewy and damp. Hot coffee helped, and so did the sleeping bag to snuggle in. 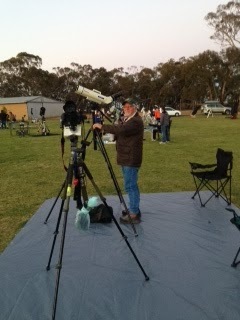 The viewing was good though, we managed to see Andromeda which is not visible from Tassie. The binoculars worked really well, the different dimension was good. The photography was terrific too. We’re looking forward to loading them onto the computer. 1:00am we packed it in. I thought I was never going to get to sleep I was so cold. Socks and PJ’s and an extra blanket didn’t cut it. It wasn’t until morning I found out there’s a heater in the room. Doh! Graham got a shot of something unusual, and I took the opportunity to ask about it, while meeting people. We had a lot of interest in his photo, and it opened the way to meet a lot of interesting people. We were pleased to be invited to look through other's scopes, and Graham was happy to invite people to look through his binoculars, and discuss his equipment with others. We left pleased people had warmed up to us in the end. I wondered if they were a little stand offish as we weren't there for the first 2 days. One last night to our mainland trip, a stop at SDM Scopes to meet Peter Read, the fellow making Graham's scope in Bunbartha. We slid up to historic Echuka for a quick look, and to watch the Melbourne Cup along the way. (No winners at our table). Peter and his wife Kim were good fun, and have a nice spot. No viewing the sky for us though as we had a huge bonfire. We laughed a lot and enjoyed the tour of their little property. What a work shop, and an observatory built over a water tank. Very ingenious, and a great indication of what staying in one place can do over 25 years. Peter took us to Broken River, a beautiful spot which would be a great place to paint or write. We had just enough time to do a spot of shopping before the ferry, and our holiday was over. We had a quiet sail back to Tassie to find Elwood, slim and fit looking fantastic. He was a little subdued for a day, I think in case we were going to take him back to the "other place" but he's back to normal now. Next time I think I'll go to the dog sitters, and see if I trim down as much.